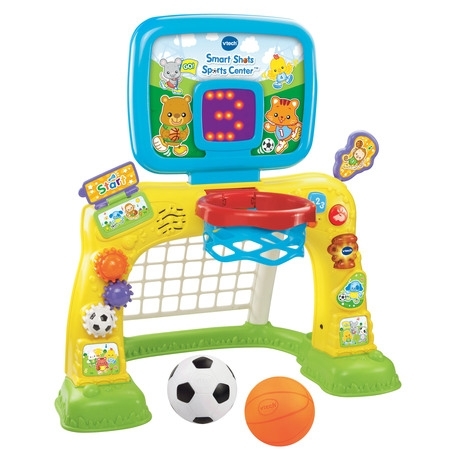 Cheer on your little sports star with the Smart Shots Sports Center by VTech. This electronic sports center features a soccer net and basketball hoop for a fun 2-in-1 play experience. Toss the basketball into the hoop and watch as the LED screen counts the number of baskets. Kick the soccer ball into the net, and the sports center will respond with encouraging sounds and phrases. In addition to counting baskets, the LED screen also encourages play with fun animations. Build fine motor skills with a variety of manipulative features. Turn the gears to hear playful sounds and press the shape buttons to learn shapes, numbers and hear fun sounds. Score, learn and win with the Smart Shots Sports Center! We love the Vtech Smart Shots Sports Center. 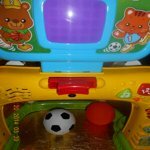 This highly interactive basketball and soccer center was very easy to put together. I was anxious while assembling it as I could not locate the directions (please note…they were in the box the entire time. They were stuck to the inside wall of the box). Once I found the directions, I inserted 6 screws and it was completely assembled. It has a light up LED scoreboard that flashes shapes and numbers. It also cheers you on when you make a basket or goal! I played for 5 minutes to make sure it was working correctly. You can set the volume at 2 different volume levels. You can also choose from music, shapes, or coaching buttons as well as push the monkey lever down to switch from basketball to soccer. Both the basketball and soccer ball were included. 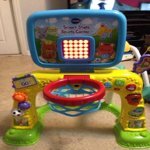 My older children loved teaching baby how to shoot baskets and kick goals. Baby was a little unsure. He liked playing with the basketball and watching the LED scoreboard, but wasn't interested in kicking in the winning goal or shooting a basket. He is a little young for the center yet…it's designed from 12-36 month old children and my baby is 7 months old. The age limit on this toy is 12-36 months. I got this toy for my 35 month old son. He is honestly too tall and old to enjoy it to it's full potential in my opinion. I mean it has wonderful developmental benefits such as gross and fine motor skills, cause and effect, and language development, but he is past most of that at this point. Despite this, it still grabs his attention and he really likes sitting down and playing with all of it's features. It it loaded with education opportunities such as learning shapes and letters, counting to 10, and over 50 songs, melodies, etc. My son also loves that it has a built in place to store the included balls when he is playing with the other features. I would also like to point out that this toy is very durable. He has been dragging it from room to room, playing with it, and has even thrown it a time or two and you cannot tell. The Sports Center has assembly required, but that is not so bad because all the pieces pretty much snap together. It practically assembles itself. The backboard has two small screws required to keep it in place. Batteries are not included and it needs AA batteries. The game is very vibrant in color, the volume isn't too loud, and there are nobs and buttons on the front of the Center to add to the fun. It comes with a miniature basketball and soccer ball. Both balls are of sturdy construction and perfect for little hands! The basketball game counts out-loud (and displays on the screen) each basket that is made, which is a very fun counting game! The center also has little songs it plays. My Five year old and my two year old both love this little sports center! I do, too, because with winter fast approaching this will make an excellent indoor activity! I highly recommend this sports center! You can't go wrong!! All I can say is WOW! All three of my children, from seven to nine months, have really enjoyed playing with this item. There are not many toys out there that can keep my two year old son's attention unless it has a train or a car on it. But, this did! From the minute we opened the package, he was engaged and excited! My son even drags it around with him from room to room. His enthusiasm quickly got the attention of my seven year old and they have enjoyed playing with it together. Their excitement quickly convinced my nine month old to join in. All three kiddos playing together nicely... priceless! It was a quick snap to assemble and we were in action. Good quality and sturdy. The sounds and lights are not too overbearing or "annoying" (mom's with toddlers know what I mean) and it's not too big to actually leave out for the kids to use any time. The basketball and soccer ball are super light and soft. My son likes to throw them. But, they are not hard enough to do any harm to anyone or anything. One of the features I love the most is there are two divots behind the yellow goal posts for the basketball and soccer ball to rest on. A+ in my book. I think we have a winner! This sports center activity set is pretty cool. Setting it up looked rather simple as I watched my husband do it. 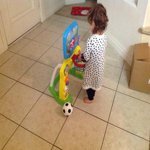 My 18 month old daughter was immediately taking the basketball and soccer ball and making slam dunks. Once the batteries were in she had a blast making baskets while listening to the score board encouraging her with how many baskets she had made. She really liked the different songs and melodies this set played and she had a blast exploring the different functions and buttons and sounds this play set had to offer. Right now she is the perfect height for this activity set at 31" tall and will be for a little while but too much taller and I can see her losing interest but for now it's pretty great and she can learn and practice counting and be encouraged and shoot hoops and also learn how to kick a ball in the goal. She has not quite figured out how to kick the soccer ball into the goal but she will get that in no time. She definitely loved playing basketball with her dad that's for certain. The set is light weight and not too bulky which is great to move around and place in my daughter's closet when not in use with no need to disassemble. I love this little activity sports center and my daughter does also which is fantastic. I absolutely love this set and would recommend this learning activity set to anyone. This sports center is made of a strong, heavy plastic type of material. The only part I was worried about was the backboard/scoreboard until I realized it has screws you place to hold it together. Otherwise it seems so easy to pull apart. Again it is held together with screws that holds it tightly together. It uses 3 "aa" batteries. The sounds and music are very encouraging. I carefully observed my 2 year old grandson playing with this and even if he tossed the ball but didn't go in if it does push down the red "hoop" it still counts it as a dunk which made him very happy and proud. It's always upbeat so it encourages the child to keep going and keep trying.. The smart shots sports center comes with two plastic balls. One is the basketball and the other is the soccer ball. Either ball fits in the hoop and it will count it as a dunk either way. Seems to be a great game for hand/eye coordination. It see it to work the muscles in the arm because you toss the ball but also you kick the soccer ball into the net so that would work the leg(s). It keeps children moving with the interactive music. There are volume modes...off, low and high. It shuts off or goes silent after a couple minutes of inactivity but will begin again if a ball is tossed or kicked again or the hoop is pressed down. It will only be off when you switch it in the off mode to completely shut it off. Overall I feel it is a very interesting and fun game and the setup is very easy. It couldn't have taken more than 5 minutes. I've had this for a few months now and watched as my daughter has progressed while playing with it. She went from just rolling the balls to make the screen light up or pulling down on the hoop to make the numbers change to actually trying to throw the ball in the hoop and kick the ball in the net. Honestly, I loved this product from the first day I received it. It was easy to put together and the packaging was very easy to remove. The batteries I put in when I first received it are still in it and my daughter plays with it almost everyday. I babysit for a lot of my family members so there are always children of varying age at my home and all the children from starting walkers and up love to play with it. It is surprisingly study and stands up to rough play pretty well. The only problem I had was that the balls came a tad bit flat, but once I got them inflated I haven't had any problems with them since. Although I have to say my favorite feature on this toy is the volume/on-off switch. There are times when I just need to lower the volume or turn it off completely. I love the fact that it was included. Overall, it is a good product for early and starting walkers. There are no ‘cons' for this toy except I made the mistake of thinking a 3 year old would enjoy it. It is great for the age of a 1 or 2 year old toddler as the ad states. It seems to be a great all around learning toy for the stated age and very durable. I found it put together very easily and seemed to be able to handle a lot of wear and tear of a toddler. A 3 year old tires of it easily. The lights and sounds keeps their attention and was very appreciative of the fact the balls included were soft. A 3 year old can have a lot of indoor fun with ‘ soft balls'! I was thinking the 3 year old would learn some basic skills from the Sports Center Play Set but as his age, there wasn't much new to him. I would advise purchasing this play set. There is so much to learn from it. My mistake of ordering it for a 3 year old. I am looking forward to some toddlers in my family coming by the play with it. Really Fantastic toy for a 1 year old. This is a great toy for a baby, what baby doesn't like to play with balls then you throw music in and its a party. I can see that this would keep a 1 or 2 year old entertained but the recommend ages of 12 months to 3 years is a little over extended I think. I have a just turned 3 year old and thought this would be good to get some activity in since its going to be winter time soon. While she is entertained by it shes not going to get a lot of use out of it. Wish it had the grow with me feature on it also. Would have been nice if the goal or rim could have been raised to meet her height. The toy was easy to assemble only needed a screwdriver and batteries. The music was catchy enough to have even my older daughter sing along to it. The score board is pretty generic and wish this was nicer quality. If the toy did not say it was clapping i would have not figured out that it was trying to display clapping hands. I would defiantly recommend for a 1 year old birthday gift they will love it. Fun, Flashy & Physical learning fun! I would give the VTech Smart Shots Sports Center an 8 out of ten. This toy offers many kinds of stimulation such as lights, sounds, songs, flaps, gears and buttons to engage the child's senses with. Two different kinds of balls (a basketball and a soccer ball) offer a way to learn to pick up, throw, kick and dunk. Similarly, sensors in the basket and the goal count out how many "dunks" or "goals" have been made while the lighted score board shows the corresponding number as well as cute symbols such as smiley faces and stick figures and even encourages learning shapes. Balls are able to be filled with a standard ball inflation needle if they deflate. There are also two bowl like divots behind the front legs for storage of balls when toy is not in use. The toy pops easily into place without instructions, however instructions are included. Also included are screws to securely fasten popped in pieces in place. Highly recommend using screws especially in long term daily use of toy because picking up or moving of toy can cause pieces to come loose if not properly secured with screws. And although I think this is a great toy, it is not without its faults. The first that I noticed is that recommended age is 12-36 mo. While I am sure that a 24-36 month old can in fact play with the toy, it is awfully short for children of this age. I think that in my opinion the toy is more suitable for children around 6-24mo. Also, basketball hoop on this toy folds down a bit, which could lead to child becoming off balance if they try and grab hoop for support. And while base is large, it is still not large enough to prevent tipping over of toy (if basket is pulled on or such). That being said I do love many things about this toy, even the small details such as cute creatures decorating the backboard, and I think this toy is a fun, flashy and physically engaging toy for a child to learn and play with!